Registi/Directors: Andrew Adamson Cast: Georgie Henley, William Moseley, Skandar Keynes, Anna Popplewell, Tilda Swinton, Sophie Winkleman, James McAvoy, Shane Rangi, Patrick Kake, Elizabeth Hawthorne, Kiran Shah, James Cosmo, Judy McIntosh, Jim Broadbent, Shelly Edwards, Stephen Ure Sceneggiatori/Writers: Ann Peacock, Andrew Adamson, Christopher Markus, Stephen McFeely, Clive Staples Lewis Voci/Voices: Rupert Everett, Liam Neeson, Ray Winstone, Dawn French Fotografia/Photography: Donald McAlpine Musiche/Music: Harry Gregson-Williams, Stephen Barton Montaggio/Editing: Sim Evan-Jones, Jim May Scenografia/Production design: Roger Ford Costumi/Costumes: Isis Mussenden Effetti speciali/Special effects: K.N.B. EFX Group Inc., Gentle Giant Studios Inc., Hatch Production, Industrial Light & Magic, Rhythm & Hues, Sony Pictures Imageworks, Svengali Visual Effects, Weta Ltd. I quattro fratelli Pevensie, attraverso un armadio magico, si ritrovano nel fantastico mondo di Narnia: un universo parallelo abitato da unicorni, minotauri, centauri, fauni, grifoni, ciclopi, un mondo fantastico, dominato dalla magia e in cui regna incontrastata Jadis, la Strega Bianca, che ha congelato tutto in un lungo inverno senza fine. Sarà l'arrivo dei quattro fratellini a portare nuova speranza al popolo di Narnia. Prepare to enter another world when Walt Disney Pictures and Walden Media present C.S. Lewis' timeless and beloved adventure. With the stunningly realistic special effects, you'll experience the exploits of Lucy, Edmund, Susan, and Peter, four siblings who find the world of Narnia through a magical wardrobe while playing a game of "hide-and-seek" at the country estate of a mysterious professor. Once there, the children discover a charming, once peaceful land inhabited by talking beasts, dwarfs, fauns, centaurs, and giants that has been turned into a world of eternal winter by the evil White Witch, Jadis. Aided by the wise and magnificent lion Aslan, the children lead Narnia into a spectacular climactic battle to be free of the Witch's glacial powers forever! 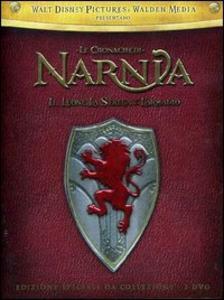 The Chronicles of Narnia, Narnia, and all other book titles, characters and locales original thereto are trademarks of C.S. Lewis Pte Ltd. and are used with permission.